Mr. Ellis Ray "PaPa” Hutton, born on October 1, 1950 in Richland, Missouri, to the late Jewel Hutton and the late Virgil Hutton, passed away at age 68 on January 24, 2019 in Saint Louis, Missouri, being held by his daughter. 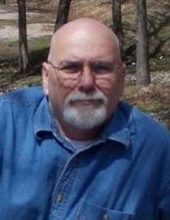 Ellis graduated from Richland Missouri High School in 1969. From 1969 to 1972, Ellis served in the Army in the Vietnam War. He was in the Diesel Mechanic industry at Springfield Public Schools as a Lead Mechanic until retiring in 1998 and in the Healthcare industry at Cox Health Systems as an Engineering Technician until retiring in 2008. He was preceded in death by his dogs, Gabe, Potter, and Dudley. Ellis is survived by his loving wife, Deborah; his daughter, Heather Hutton Harter; son-in-law Drew Harter; grandchild, Duncan Hensley Harter; and friends, Ken and Connie Tipton, Amy Lassley Hammond, Buff and Sherry Lassley, Ron and Brenda Harter and family, Larry Maggie Riley and Nathan Hunt, Bill and Sally Berentis, the Obannon family, the Coker family, Brad and Gail Groves and family, and Ralph and Carol McClurg. He also leaves behind his greatly loved pet, Petey the bird. Ellis' hobbies included wood working, baking cobblers for friends, basket making, collecting movies, and watching his grandson Duncan Harter play Billings Wildcat baseball. He was a prayer group member at Mount Vernon Church of Christ. He loved being a Camp Counselor at Happy Hollow Bible Camp where he baptized many brothers and sisters in Christ's name. To send flowers or a remembrance gift to the family of ELLIS RAY HUTTON, please visit our Tribute Store. "Email Address" would like to share the life celebration of ELLIS RAY HUTTON. Click on the "link" to go to share a favorite memory or leave a condolence message for the family.